Shanghai’s cuisine isn’t considered part of China’s Eight Great Traditions, even though treats like xiaolongbao have made a splash all over the world. However, where the city lacks in hometown specialties, it excels in international flavors. Surely, you can find everything from samosas and sushi to spaghetti and, you guessed it, sandwiches. You already know where this article is heading, so without further ado, here are some of the best places to grab a sandwich in Shanghai. Co Cheese is one of my all-time favorites. Greg, the Canadian owner, has created some very unique grilled cheese sandwiches, which include Hunan hongshaorou and gouda, Peking duck, and even a Thanksgiving-style sandwich with turkey and mash potatoes. You can even build your own masterpiece if you wish. All of his melts are served between two slices of buttered-up San Francisco sourdough bread, and they come with a side of chips and pickled veggies. Apart from excellent sandwiches, Co Cheese has a wonderful array of hot sauces (some claiming to be the spiciest in the world), Kraft Macaroni and Cheese, Campbell’s Tomato Soup, and phenomenal pickle-back shots. For a taste of Italia, look no further. Scarpetta places a high emphasis on quality ingredients – the veggies are crisp and crunchy while all the meats and cheeses are imported straight from Europe. The sandwich that does it for me is the prosciutto and pesto (to die for! ), but all the other ones (especially paninis) are just as good. It’s also worth mentioning that its location in Xintiandi makes it quite the trendy hangout. 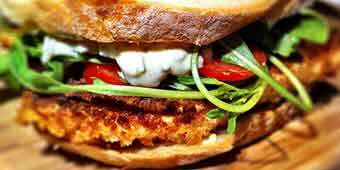 If you’re not in the mood for sandwiches, you can either, order one of their other Italian inspired dishes. Ahhh Munchies, a cornerstone of Shanghai expat life. Some die-hards will even tell you that you’re not a true Shanghai expat until you’ve eaten at Munchies! While I definitely disagree with that, I will say that if you’re looking for greasy, heavy grub, this establishment undoubtedly takes home the gold. I get the Philly Cheese Steak, and the Reuben is delicious too, but there are also hot dogs, burgers and sides in case you’re really ready to stuff your face. On another note, their stuffed chicken wings go great with any one of their sandwiches, especially when it’s 3:00 am and you’re just “craving” the late night munchies. Another Canadian owned establishment, Tock’s prizes itself as an authentic Montreal deli. It’s also another one of the most popular expat destinations in town for Western fare. But enough of that, let’s get to the sandwiches: Smoked Duck Pastrami, Smoked Meat, Smoked Chicken Pastrami, and just about any other smoked meat you can think of. And oh yeah, get this, they even have Montreal’s favorite – poutine! (French fries topped with gravy and cheese curd). Albaluz is not a sandwich joint per se, rather a Spanish tapas restaurant. However, they make this sandwich list for creativity and deliciousness with their bocata sandwich. The bocata is basically an open-faced sandwich filled with just about anything – calamari, foie gras, cold cuts, cheeses, vegetables, etc., and all bocatas come with a side of scrumptious fries. The atmosphere is posh and trendy, which rises the prices a tad, but it’s nonetheless a fun place to wine and dine (they do indeed have an excellent wine selection). A word of advice: definitely try the bocatas while here, but don’t pass on the paella, tapas and other Spanish favorites. Simplicity is the key to Sarnies’ success. No thrills, no nonsense, no BS… It’s literally a hole in the wall with a few make-shift stools plopped out front, and most get their sandwiches to go. Less is more: think basic cold cuts with a few slices of veggies thrown in for health, and the priciest thing on the menu is “the Sarnies” (less than 30 RMB), which is stuffed with layers of melted cheese, chicken and potato chips. They also have fresh squeezed juices which run for cheap, along with some veggie wraps. I want go wow Poor brother . This temptress has ruined his life.